Although the cultural ties between China and Hawai’i stretch back over 200 years, there has little or no contact between Hawaiian and Chinese music. This is the first recording where the steel guitar, Hawaiian slack key guitar, and `ukulele meet the Chinese erhu. People have traveled to Hawai’i in search of an idealized island paradise for centuries, for its natural beauty, lush tropical environment, and island culture. In addition to the indigenous Polynesian culture that first settled the islands, Hawai‘i’s musicians have adapted the music of other cultures to create music that is uniquely Hawaiian–the Hawaiian technique of ki ho’alu or slack key guitar, the `ukulele, and the Hawaiian steel guitar. 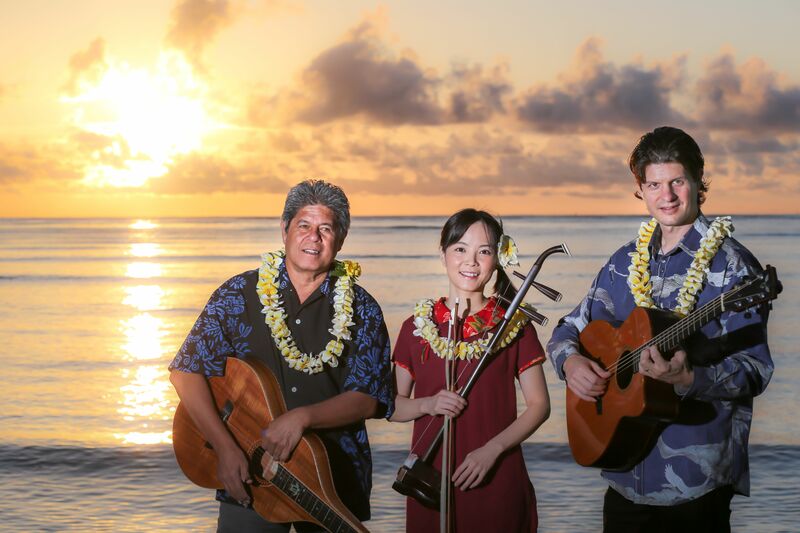 And, since the beginning of the 20th century, musicians in other parts of the world have embraced the music of Hawai’i while adopting and adapting in turn. Greg Sardinha is one of the foremost Hawaiian steel guitarists of his generation and has contributed to this Hawaiian art form for more than three decades as a musician, songwriter, arranger, and record producer. Jeff Peterson is unique among ki ho’alu guitarists — in addition to his mastery of slack key techniques, he has also had extensive formal training in the traditions of Western (European-American) classical and jazz guitar. Taiwan-born Tsun-Hui Hung is internationally recognized as one of the most innovative players of the erhu. The program includes originals, classic Hawaiian, and Chinese melodies. Some of these songs were written to celebrate the beauty of Hawai’i. Others describe the experience of traveling to reach a cherished place. This recording opens a new chapter in the evolution of Hawaiian music. We hope these songs will inspire all the travelers as they journey to realize their dreams.